A Century-Old Technique That's New Every Day! F.M. 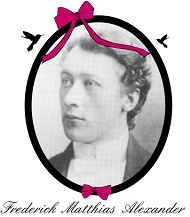 Alexander (1869-1955) was a Shakespearean actor with a major problem - he lost his voice when he performed. No doctor was able to help him, so he spent nearly a decade observing (with mirrors) how he moved (on stage and off) in order to determine what might be causing his persistent hoarseness. His discoveries led to his healing - and to his creation of the Alexander Technique. The Alexander Technique (AT) calls upon conscious awareness and thought to be applied to how we move everyday (e.g. getting in and out of a chair). The Principles of the Alexander Technique enable us to reduce the various forms of compression and other physical stress in our bodies, and thereby reduce much of the tension we feel. The awareness and skills gleaned from the study of AT are integrated into whatever activity you do... whether you are "driving the lane" in basketball, playing the piano or enjoying your daily walk through the park. move with ease, efficiency and poise! Over the years AT has been an essential technique for actors, singers, musicians, dancers. AT has lately has been 'discovered' by athletes and by people in all walks of life! What are the benefits of studying the Alexander Technique? The benefits AT offers are many, and quite varied. Students who study Alexander Technique have noted the following physical and emotional benefits: posture/carriage improves; back, neck and joint pains diminish and/or disappear. With increased self-awareness and mindfulness, interpersonal skills often improve and even anxiety lessens. The study of AT has been helping the 'baby boomers,' many of whom are now in their 60's, to maintain balance and coordination. And, most importantly, students learn to remember to breathe! As with other mind/body disciplines, AT enhances "self" and "life" awareness.